This Department contains all of the wire rope in stainless steel. 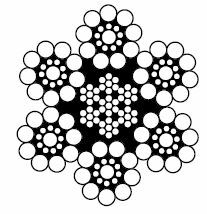 Larger diameters are in wire rope. 316 stainless steel wire rope is available, check with sales for cost and availablity. Wire rope is one of the strongest forms of “rope” derived from tightly twisted strands of metal. As a component, it is of tremendous value in machinery or structural design: Unlike linked chains, stainless steel wire rope maintains its integrity in the unlikely event of a “weak link,” where all other strands combined can share the load. Sold by the foot or bulk rolls. CONTACT OUR SALES DEPARTMENT FOR SPECIAL LENGTHS AND BULK PRICING!